SOG A01-P A01-P Arcitech LE Plain Edge Folding Knife FREE SHIPPING! A high-end collectable with the strength and reliability SOG is know for, the Arcitech LE Plain Edge Folding Knife is an impressive addition to the collection of any knife aficionado. Featuring an intricately crafted body and a meticulously forged blade, the Arcitech manages to combine tactical functionality and artistic beauty into one durable package. The VG-10 steel blade is laminated with 420J2 stainless steel, creating a powerful and long-lasting edge that is resistant to elemental damage. Arc-Lock technology works in tandem with the Abalone jeweled thumbstud to provide a smooth opening with a flash of royalty. A jigged bone handle with titanium bolsters complete the knife's exquisite appearance for a truly one-of-a-kind collector's item. 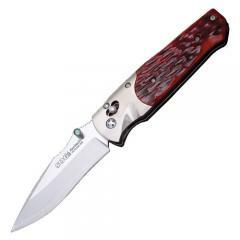 ©2002-2019 CopsPlus.com: SOG A01-P A01-P Arcitech LE Plain Edge Folding Knife FREE SHIPPING!